But, moving on, this post is not about store bought bread, it’s about olive oil bread. Home baked olive oil bread to be exact. I was back in the bread baking saddle again! This particular recipe comes from Tessa Kiros’ enchanting book Falling Cloudberries. an aside: I love this book…Tessa Kiros is a lyrical writer and weaves a delightful web of memories around the recipes she shares. It is perfect for dreamers like me, whose cooking and baking is really more aspirational than professional. Also, it has recipes from her life in Finland and Greece, two places that have touched my own life (as well as stomach) greatly. I had to change the recipe a bit simply because I had no fresh yeast, nor oven roasted tomatoes. Also, I decided to bake the bread in a loaf pan instead of in 2 smaller baguettes (mainly so I could make sandwiches). – In a large bowl mix together the yeast, olive oil, sugar, and 1 cup tepid water. Leave for about 15 minutes, until it starts looking frothy. – Add the flour and the salt and mix with your hands or a wooden spoon until it comes together, then turn out onto a floured wooden board or work surface and knead for about 10 minutes, until firm, smooth, and elastic. – Place the dough back in the bowl and cover with a tea towel. Leave in a warm, draft-free spot for 1 1/2 to 2 hours until it has doubled in size. – Punch down on the dough and give it 1-2 scant kneads, form into a loaf, and place in a loaf tin that has been oiled slightly (it is at this point, after punching down, that the original recipe mixes through the oven roasted tomatoes and divides into 2…you can also use other ingredients you think would be good). Cover once more with a tea towel and leave to rise for 30 minutes. 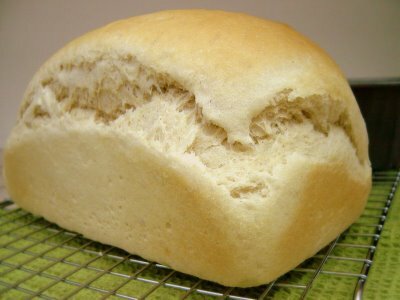 – Remove tea towel and bake loaf for about 20 minutes (bottom of loaf should sound hollow when you knock on it). – Cool slightly before slicing.